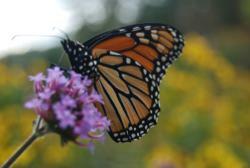 The Monarchs, en route to Mexico, stop to feed on the wildflowers in fields along the preserve’s oceanside trail. The bike tour company that promotes freedom on two wheels, Great Freedom Adventures, announces 2013 Northeast USA bike tours and adventure vacations in diverse locales that span the mountains of Vermont to the shores of Martha’s Vineyard. 2013 travel booked by November 30, 2012, locks in 2012 rates. The bike tours and multi-sport adventures range from three to six days in duration and are distinguished by meticulously planned cycling routes and a wealth of unique off-the-bike activities that are included in the tour packages. Throughout the journey, guests on a Great Freedom Adventure learn about the ecology and wildlife of diverse habitats and explore fascinating local history, art and architecture. Each tour draws from a depth of local knowledge to provide an insider’s perspective on the naturally and culturally diverse regions. Company founder, Jeanne Rummel and team, have culled favorite sites, scenes and routes drawn from decades of bike touring northeast US, to provide one-of-a-kind itineraries that immerse and engage the traveler to open up new worlds. In addition to cycling, tours may include activities such as an eco-kayak adventure, a sunset sail on a custom trimaran, walks along a coastal bluff or a panoramic mountaintop or a visit to a winery, lighthouse, working waterfront, artist’s colony or historic mansion. The 2013 tours are carefully timed to take advantage of the arrival of songbirds on Atlantic Flyway stopovers, the bounty of the local harvest or the radiance of the fall foliage. This attention to detail even includes walking a nature preserve during the Monarch butterfly migration, a highlight of the Rhode Island itinerary. “The Monarchs, en route to Mexico, stop to feed on the wildflowers in fields along the preserve’s oceanside trail,” said Rummel. Accommodations include seaside resorts and fine historic inns, each selected to enhance a region’s unique flavor and history while also providing upscale amenities. Distinctive dinners include a farm-to-table feast at a working hilltop farmstead and a gastronomic fete at the Culinary Institute of America. Vacation packages include lodging, most meals, entrance fees, side-excursions, guides, luggage transport, van support and other region-specific costs. Guests may bring their own bike or rent one at no additional charge. As in previous years, the 2013 bike tours are designed to be appropriate for all abilities and interests, from avid cyclists through occasional cyclists, and to allow guests to travel at their own pace with optional daily mileage ranging from eight to 55 or more. Private, corporate and custom trips are available. For more information about the tours, including full itineraries, or for details on the early booking savings, please visit: http://www.greatfreedomadventures.com. Great Freedom Adventures offers bike tours in New England and New York in regions possessing a unique diversity of natural and cultural interests. The tours are distinguished by including a wealth of additional activities such as kayaking, hikes, nature walks, history tours, sunset sails, demonstrations and others, which provide guests with a novel and authentic travel experience. The tours are three to six days in length and are guided and supported. Please see the website for additional information and for specific details on each tour.